And so the speculation continues! The other day, we wrote about a Half-Life 2 update that featured Korean audio. It was a mistake according to Valve, and they fixed it—but that didn't stop fans from freaking out. Now fans found something else that looks suspicious in a different game, Surgeon Simulator 2013. Hmm. Korean update to Half-Life 2, and a puzzle that includes Korean in a game featuring Team Fortress 2 characters. The former was supposed to be a mistake, but still, this all looks a little suspicious, no? We've contacted them to ask if it's an ARG puzzle of some sort, and if it's related to a Valve product—we'll update if we hear back. For now, popular theories around the web have to do with Half-Life 3 (obviously), a new Team Fortress update, if not something giving a nod to an eventual Steam Summer Sale. What do you think? Do any of these seem likely, or is it just the internet getting out of hand again? Indeed it's an ARG, but I'm afraid it doesn't have anything to do with a Valve game. 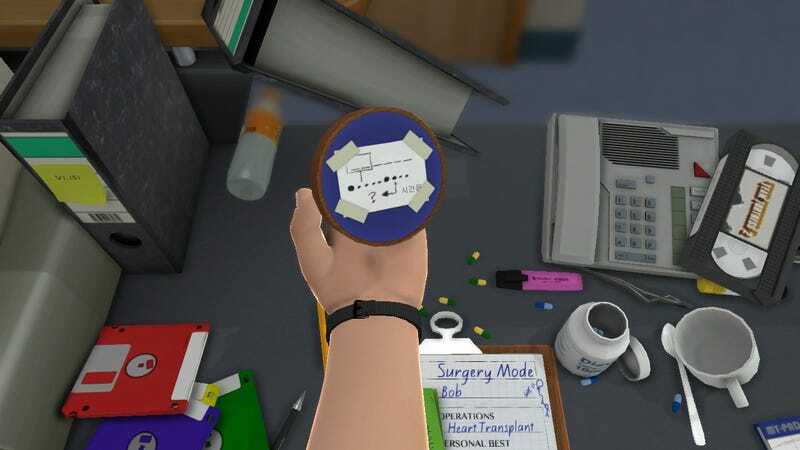 It's a key piece of an upcoming update to Surgeon Simulator, and the info found there is relevant to the puzzle — we just had no idea it could have been read in such a broad way to fit so many theories! Hope this helps, and sorry for the trouble.